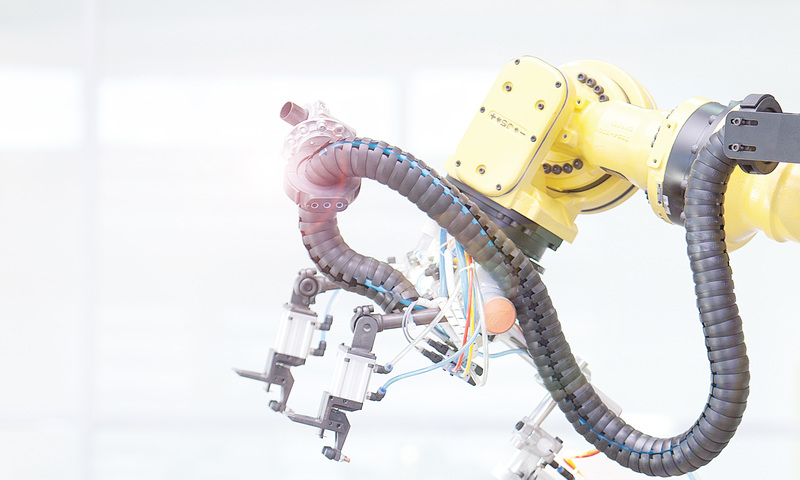 Capacitive proximity sensors are non-contact devices that can detect the presence or absence of virtually any object regardless of material. They utilize the electrical property of capacitance and the change of capacitance based on a change in the electrical field around the active face of the sensor. A capacitive sensor acts like a simple capacitor. A metal plate in the sensing face of the sensor is electrically connected to an internal oscillator circuit and the target to be sensed acts as the second plate of the capacitor. Unlike an inductive sensor that produces an electromagnetic field a capacitive sensor produces an electrostatic field. The external capacitance between the target and the internal sensor plate forms a part of the feedback capacitance in the oscillator circuit. As the target approaches the sensors face the oscillations increase until they reach a threshold level and activate the output. Capacitive sensors have the ability to adjust the sensitivity or the threshold level of the oscillator. The sensitivity adjustment can be made by adjusting a potentiometer, using an integral teach pushbutton or remotely by using a teach wire. If the sensor does not have an adjustment method then the sensor must physically be moved for sensing the target correctly. Increasing the sensitivity causes a greater operating distance to the target. Large increases in sensitivity can cause the sensor to be influenced by temperature, humidity, and dirt. There are two categories of targets that capacitive sensors can detect the first being conductive and the second is non-conductive. Conductive targets include metal, water, blood, acids, bases, and salt water. These targets have a greater capacitance and a targets dielectric strength is immaterial. Unlike an inductive proximity sensor, reduction factors for various metals are not a factor in the sensors sensing distance. The non-conductive target category acts like an insulator to the sensors electrode. A targets dielectric constant also sometimes referred to as dielectric constant is the measure of the insulation properties used to determine the reduction factor of the sensing distance. Solids and liquids have a dielectric constant that is greater than vacuum (1.00000) or air (1.00059). Materials with a high dielectric constant will have a longer sensing distance. Therefore materials with high water content, for example wood, grain, dirt and paper will affect the sensing distance. 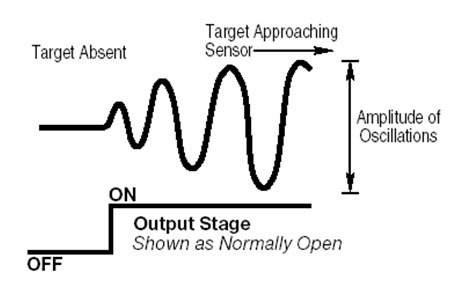 When dealing with non-conductive targets there are three factors that determine the sensing distance. A capacitive sensor’s maximum published sensing distance is based on a standard target that is a grounded square metal plate (Fe 360) that is 1mm thick. The standard target must have a side length that is the diameter of the registered circle of the sensing surface or three times the rated sensing distance if the sensing distance is greater than the diameter. Objects being detected that are not metal will have a reduction factor based on the dielectric constant of that object material. This reduction factor must be measured to determine the actual sensing distance however there are some tables that will provide an approximation of the reduction factor. Rated or nominal sensing distance Sn is a theoretical value that does not take into account manufacturing tolerances, operating temperatures and supply voltages. This is typically the sensing distance listed in various manufactures catalogs and marketing material. Effective sensing distance Sr is the switching distance of the sensor measured under specified conditions such as flush mounting, rated operating voltage Ue, temperature Ta = 23°C +/- 5°C. The effective sensing range of capacitive sensors can be adjusted by the potentiometer, teach pushbutton or remote teach wire. Hysteresis is the difference in distance between the switch-on as the target approaches the sensing face and switch-off point as the target moves away from the sensing face. 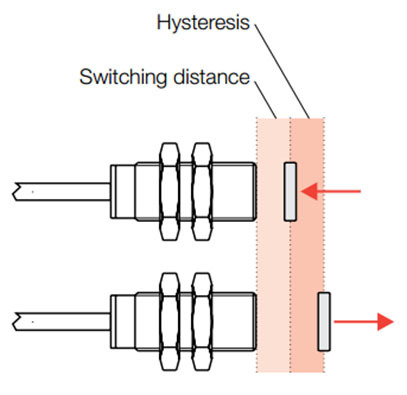 Hysteresis is designed into sensors to prevent chatter of the output if the target was positioned at the switching point. Capacitive sensors have a potentiometer or some method to set the sensor sensitivity for the particular application. In the case of a potentiometer, the number of turns does not provide an accurate indicator of the sensors setting for a couple of important reasons. First, most potentiometers do not have hard stops instead they have clutches so that the pot is not damaged when adjusted to the full minimum or maximum setting. Secondly, pots do not have consistent linearity. To determine the sensitivity of a capacitive sensor the sensing distance is measured from a grounded metal plate with a micrometer. The plate is grounded to the negative of the power supply and the target is moved axially to the sensors face. Move the target out of the sensing range and then move it towards the sensor face. Stop advancing the target as soon as the output is activated. This distance is the sensing distance of the sensor. Moving the target away and noting when the output turns off will provide the hysteresis of the sensor. To learn more about capacitive sensor technology visit www.balluff.com.